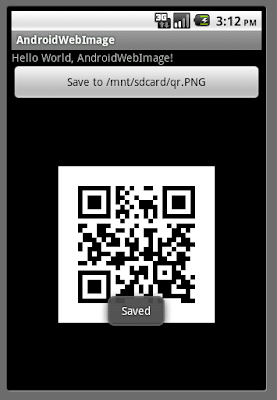 In the previous exercises "Load ImageView with bitmap from internet" and "Generate QR code using Google Chart API", images were downloaded from internet for display only. Here, we are going to save the download image to SD Card. In order to premit the App to access internet and write to SD Card, we need "android.permission.INTERNET" and "android.permission.WRITE_EXTERNAL_STORAGE". Thanks to this blog,i am using Save file to SD card code from this blog,but this code run and store file in sd card at first time,another time i run this code,did not store file in sd card. Are you using the same file name? May be you have to handle the Exception case. Your code is really helpful... keep going....! At last, a collection of examples that are extremely well written and comprehensible! I've read many Android books and they're too difficult for the beginner and tend not to provide useful functions. hi.. the code was very helpful..can you please help me, if i want to save the image to sdcard call from drawable folder. That helped me, thank you! I am getting null pointer exception at Loadimage().